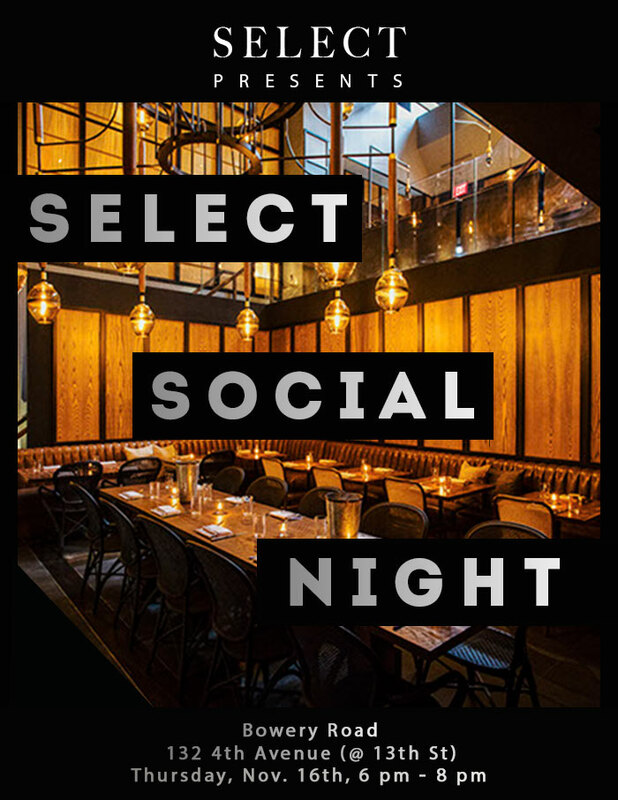 You are invited to the next SELECT NY Social Night! Join us on Thursday, November 16th, as we gather downtown for another intimate evening of cocktails and casual mingling. Upon arrival at 6 pm, Members will receive wristbands to enter a private section of Union Square watering hole and eatery Bowery Road. Inside the event, enjoy an open bar from 6 - 7pm, featuring complimentary house cocktails and spirits, along with wine and beer, followed by a cash bar. Members are also encouraged to stay for dinner, and will receive 20% off the final check when doing so on the night of the event. We look forward to seeing you there! This event is complimentary for SELECT Members and one Preferred Guest each, with further guest tickets available for $20 each.